Diagonal cracks in interior wall that end at the corners of doors and windows. Cracks may also occur at the intersection of walls and ceilings and the corners of wall surfaces. Check if your doors bind or do not open or close properly. The gap between the door top and the adjacent door frame should be uniform and straight. Your windows should open and close properly. The foundation floors should be level and not rise or sink in any area. The exterior bricks should not have noticeable cracks or separation. Look for separations of wood trim at the exterior corners of your home above the brick. Lastly, check for separations of the brick and the adjacent wood surfaces at the sides of garage doors or at the sides of the chimney. Whether you actually have a concrete foundation problem. How many piers are necessary to level your foundation and a placement diagram. Description of how the Mega Piling Piers are constructed and installed. Approximately how many days it will take to repair your foundation. When we could begin your foundation repair. The total cost to repair your foundation. US Foundation Repair’s solution for your home foundation repair utilizes the proven process encompassing the Mega Piling System. This is very effective for Houston foundation repairs. Upon arrival on day one, US Foundation Repair will determine the exact pier positioning. Special care is taken to remove any bushes or shrubs prior to foundation leveling. Installation holes are prepared by the crew: 3 ft square, 4 ft deep, and directly under the grade beam. The Mega Piling Piers are then prepared for installation. 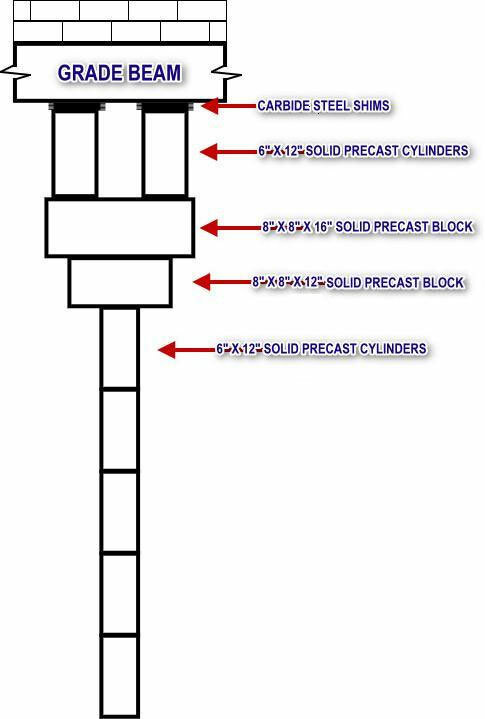 Cylinders with dimensions of 6 inches in diameter and 12 inches long and made of solid concrete, are typically placed 6 feet apart to achieve maximum support. The cylinders are driven one on top of another using the weight of the home and a hydraulic press. Cylinders are installed and pressed to reach stable soil. This stable soil is the basis for your new home foundation. This technique is the solution to our foundation repair success. The pre-cast block piers are then constructed and the home is prepared for foundation leveling. At this point we need to access the inside of the home to ensure proper slab leveling. This is the only time we need to be inside the home. Our suggestion is to remove any valuables, mirrors, or pictures from the walls prior to the leveling process, to ensure that nothing is damaged. The home is leveled utilizing the carbide steel shims, returning as close as possible to its original horizontal position. At this point, mirrors, pictures, and valuables can be reinstalled. Once your home foundation has been leveled, it is time for final clean up. Bushes or shrubs will be returned to their original landscape position. US Foundation Repair’s goal is to make it virtually impossible for you or your neighbor to know your foundation has been repaired. We take pride in this step!